For the past two decades, Leona Edmiston’s frocks have embraced the bodies of some of the world’s most beautiful women including Drew Barrymore, Susan Sarandon, Kristen Davis, Elle McPherson and Jennifer Hawkins. With her design style described as ‘elegant, versatile and ageless’, it comes as little surprise that the lady behind the label is all of those things and more. Last Wednesday night I had the pleasure of meeting Leona before the launch of her new-look QueensPlaza boutique—an intimate celebration which not only marked the opening of her new flagship store, but the launch of her Spring/Summer collection. Dressed in one of her newest pieces, her hair in its trademark topknot and opaque tights and a mixture of chunky bangles for accessories, Leona had nailed effortless chic and I—in my little black dress—was green with envy, especially when I then broke the heel on my stiletto. As wait staff put the finishing touches on the night’s sweet treats of champagne, iced tea, macarons and miniature cupcakes, we chatted fashion (and I pretended to know what I was talking about). Meeting the fabulous ‘Queen of the frock’ Leona Edmiston. “I suppose I’d always loved style and played with my mum’s accessories and things like that. And after school I really had no idea, I was so directionless and my parents enrolled me in a design course and, basically from that point, and it was only a year, I found my calling,” Leona said. It was during that year-long course at East Sydney Technical College that Leona met Peter Morrissey, the only boy in her class and although the pair didn’t speak for the first six months, they would go on to become business partners. The pair formed Morrissey Edmiston in 1983 and went on to become Australia’s darlings of fashion dressing celebrities including Nicole Kidman and Tom Cruise, Kylie Minogue and Jon Bon Jovi. Fourteen years later, the duo parted ways and in 2001, Leona launched her own label, Leona Edmiston, with the backing of partner Jeremy Ducker. Her label was touted as a tribute to the dress; a timeless piece which could be worn from the ‘office to the opera’. Now, more than a decade on, Leona Edmiston’s dresses remain in demand as women seek to embrace their femininity while maintaining an effortless style and sophistication. In May, Leona received the InStyle Women of Style Award for fashion and her brand now services more than 30 stand-alone boutique stores nationally and is stocked in all 67 Myer locations. “My style hasn’t really changed over the years because, as a label, I’m much more interested in style than in trends. I’m still the same sort of core look; it might be quite simple but it works,” she said. Although this year’s Spring/Summer 2014/15 collection is now in store (with new frocks arriving each month), Leona is already looking ahead to next year’s Spring/Summer collection. “I probably spend six months prior to designing collecting my prints; I buy a lot of archived prints from around the world and many of them are quite old, some date back to the 1800s,” she explained. “Even in this range (Spring/Summer) there is an Edwardian print from the turn of last century and there are lots scattered through this range of a similar vintage. We also have one, a Parisian print—from the 50s. With her prints selected, Leona sets about designing her collection using a mix of fabrics from her signature sleek jersey through to luxurious silks and cotton. And, to the delight of many Australian women, and unlike so many of her peers, she designs for a size six through to a size 20. “I can’t tell other designers what to do, I can only do what I feel is right with my brand and I know that for my brand, our size 16 is our quickest selling size,” she said. “For us, that’s been our customer so we have made sure we look after her. We have taken our collection up to a size 20, but also gone down to an extra, extra small. Leona said she was always inspired by an evening with her loyal customers. “It is a wonderful thing, a beautiful thing. When I’m back at my office after meeting all the women I’ll remember them and I’ll remember what they love and what they need,” she said. While the GFC hit the fashion industry hard, Leona Edmiston survived the economic downturn to emerge stronger than ever. “You need to be very adaptable, to see the signs early, adapt early and change quickly. Sometimes you need to make big structural changes to your business which we have done,” she said. Those big structural changes included the closure of her stores in London, LA and Shanghai. She also pulled stock from boutiques across the US and UK. Post-GFC, Leona’s success has seen the brand expand into additional lines including Leona Edmiston Sleepwear, Pins hosiery (my favourite), Eyewear, Footwear, Bags, Jewellery, Leona Edmiston Ruby (a diffusion of younger styles) and Little Leona for the little ladies. And although you won’t catch her poolside without covering up her fair skin, Leona has also released a line of vintage-inspired swimwear designed to flatter a variety of shapes and sizes—and featuring lower leg lines than most swimwear now available. Leona’s ability to adapt to change also came in handy in her personal life, following the birth of twin daughters Dusty and Dylan in 2012. “Things aren’t that different; I just have less time,” she laughed, adding that they aren’t ‘dress girls’ just yet. 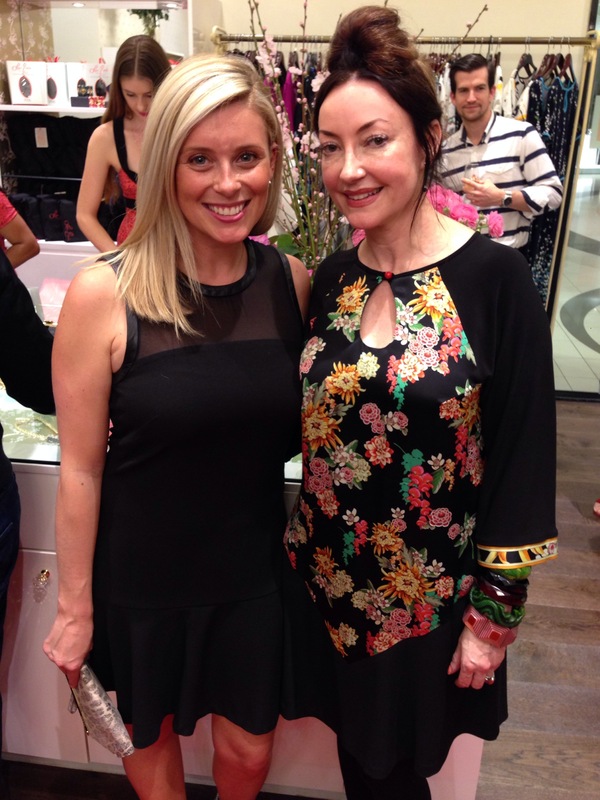 With stylist and blogger Caitlin Harrison of Chasing Cait. My date for the night, Jenny G.
Oh, what a wonderful evening; so lucky to meet Leona!